In 1965, Gordon Moore, cofounder of Intel and Fairchild Semiconductor (two giant companies that produce electronic components for electronics and computers), stated in an Electronics magazine paper titled “Cramming More Components Onto Integrated Circuits” that the number of components found in integrated circuits would double every year for the next decade. 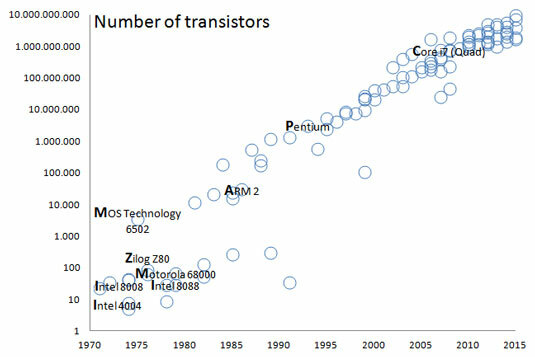 At that time, transistors dominated electronics. Being able to stuff more transistors into a circuit using a single electronic component that gathered the functionalities of many of them (an integrated circuit), meant being able to make electronic devices more capable and useful. This process is integration and implies a strong process of electronics miniaturization (making the same circuit much smaller, which makes sense because the same volume should contain double the circuitry as the previous year). As miniaturization proceeds, electronic devices, the final product of the process, become smaller or simply more powerful. For instance, today’s computers aren’t all that much smaller than computers of a decade ago, yet they are decisively more powerful. The same goes for mobile phones. Even though they’re the same size as their predecessors, they have become able to perform more tasks. Other devices, such as sensors, are simply smaller, which means that you can put them everywhere. What Moore stated in that article actually proved true for many years, and the semiconductor industry calls it Moore’s Law. Doubling did occur for the first ten years, as predicted. In 1975, Moore corrected his statement, forecasting a doubling every two years. This figure shows the effects of this doubling. Stuffing more and more transistors into a CPU. In addition, Moore’s Law isn’t actually a law. Physical laws, such as the law of universal gravitation (which explains why things are attracted to the ground as discovered by Newton), are based on proofs of various sorts that have received peer review for their accuracy. Moore’s Law isn’t anything more than mere observation, or even a tentative goal for the industry to strive to achieve (a self-fulfilling prophecy, in a certain sense). In the future, Moore’s Law may not apply anymore because industry will switch to new technology (such as making components by using optical lasers instead of transistors). What matters is that since 1965, about every two years the computer industry experienced great advancements in digital electronics that had consequences. Some advocate that Moore’s Law already no longer holds. The chip industry has kept up the promise so far, but now it’s lowering expectations. Intel has already increased the time between its generations of CPUs, saying that in five years, chip miniaturization will hit a wall. You can read this interesting story on the MIT Technology Review. Moore’s Law has a direct effect on data. It begins with smarter devices. The smarter the devices, the more diffusion (electronics are everywhere in this day and age). The greater the diffusion, the lower the price becomes, creating an endless loop that drove and is driving the use of powerful computing machines and small sensors everywhere. With large amounts of computer memory available and larger storage disks for data, the consequences are an expansion of the availability of data, such as websites, transaction records, a host of various measurements, digital images, and other sorts of data flooding from everywhere.